In 1939, Frances Faviell was living in Cheyne Place, Chelsea. She was an artist in her mid 30s & had just met Richard Parker, the man who would become her second husband. She had a facility for languages & trained as a Red Cross volunteer in preparation for the bombing that became more & more inevitable as Germany invaded & occupied Holland, Belgium & France. The Blitz devastated many parts of Britain but Chelsea, close to the main bridges over the Thames, was one of the most heavily bombed areas of London. 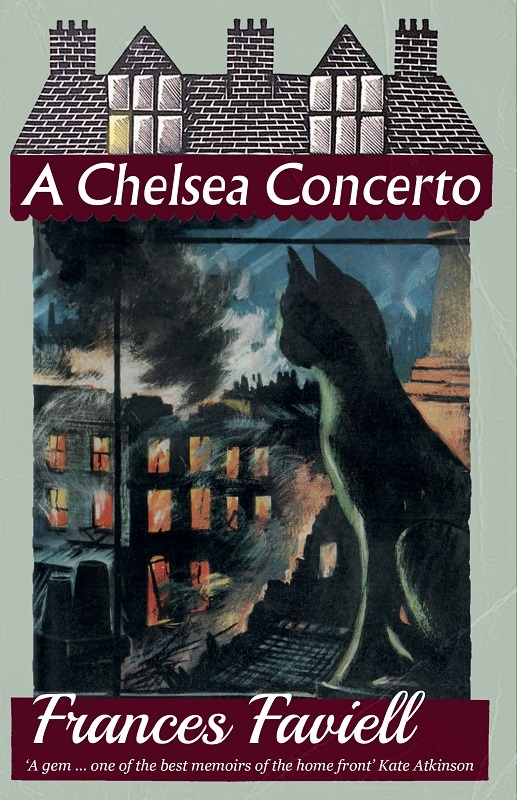 A Chelsea Concerto tells the story of the Blitz through the eyes of a compassionate, sensitive woman whose common sense, patriotism & sense of humour were tested but never entirely broken by the onslaught. Faviell's memoir begins with the process of training as a Red Cross volunteer during the early months of the war. This period of Phoney War allowed London to prepare but also added to the sense of unreality as volunteers were bandaged up after imaginary bombing raids & practiced putting out incendiary bombs with sand & stirrup pumps. Practice shifts in hospitals were interspersed with lectures, including one by a doctor who had served in Spain during the Civil War. His words, "Casualties don't choose their place of annihilation - the bombs choose them - anywhere - anytime. You must be prepared for anything. ", came back to Frances many times during the years that followed as the sometimes comical practice sessions gave way to the first bombing raids. Frances Faviell was part of an artistic community in Chelsea that included Rex Whistler, with whom she'd studied at the Slade, & Edith Walker. She lived with her dachshund, Vicki (later nicknamed Miss Hitler because of her German origins), in a flat in a house on Cheyne Place that became a haven for her many friends. Her most prized possession was a green cat made of celadon that she had acquired as she left Peking in 1937. The cat was the Guardian of the Home & the man who gave it to Frances in exchange for her camera, told her that her home would be safe as long as the cat was treated with respect. Mrs Freeth, Frances' housekeeper, was a remarkable manager who kept the household running no matter what else was happening. Frances acknowledged that she couldn't have got through those years without Mrs Freeth's support. On the top floor lived Kathleen Marshman & her daughters, Anne & Penty. Penty was intellectually disabled & was sent to live in the country when the Blitz began. Kathleen ran a dress shop & was a close friend of Frances even though she was older. Other friends included Larry, an American who had joined the Canadian Army & Cecil, a Canadian soldier who fell in love with Anne Marshman. Frances & Mrs Freeth also kept open house for the Civil Defence workers in the area who could rely on a cup of tea or bowl of soup after a long shift. As the first refugees from Belgium began arriving, her language skills proved useful & she became an interpreter for a group of refugees living in Chelsea.This was a challenging task as the refugees were naturally shocked & traumatised by their experiences. The men were mainly fishermen who wanted to get back to their boats but the authorities had to screen them before allowing them into the community. Frances began teaching them English & tried to find them some employment to keep them busy as idleness & worry led to disputes over cooking & cleanliness. Vegetable plots were successful until the most difficult of the refugees, called by Frances the Giant, accused two others of stealing some of his plot &, once again, the police asked Frances to sort it out. Other friends needed more support. Ruth, a German Jewish refugee, became suspicious of authority, convinced that she was being followed, her phone was tapped & that They would take her away. Her paranoia led to a breakdown & she attempted suicide. Ruth's daughter, Clara, became Frances's responsibility & she paid her school fees while Ruth was in hospital. Another young woman, Catherine, who had fled Belgium ahead of the invading German Army, narrowly escaped death as the refugees were bombed & shot at. She arrived in London alone & pregnant. She had been unable to marry her boyfriend in the rush of war & was obsessed with the shame of her predicament & with the perceived hostility of the other refugees to her plight. Frances supported her throughout her pregnancy & cared for the baby, Francesca, when Catherine failed to bond with her. The Blitz was unrelenting during 1940. Sirens went nearly every night & sometimes during the day as well. Frances was working at a First Aid Post (FAP) as well as helping the Belgian refugees & also relieving telephonists at the Control Room in the Town Hall, taking messages for the Civil Defence staff. The bombs fell night after night, unexploded bombs (UXBs) were a hazard as well & negotiating the streets in the blackout during a raid had dangers of its own as Frances discovered when she almost fell into a crater that had once been a house. Running into a half-dressed woman who had been thrown clear when the bomb hit, Frances witnesses the efforts of the rescue crew to remove debris & rubble to get to the people who had been sleeping in the basement. And almost at once there was sudden violent activity in the dead, ravaged street; the wails were drowned in the jarring of brakes, the screeching of engines, and sudden short sharp commands. In the thick evil-smelling blackness it was an eerie and ghastly sight to see all the preparations being made, the paraphernalia unloaded. did any of us realise how terribly dangerous and treacherous it was to have to excavate, shore up, and tunnel in such complete blackness for buried bodies - living or dead? Did we appreciate it until we saw it? I know that I had not until I watched the tunneling for Mildred Castillo and that had been mostly in day-light. On another journey she was called on to be lowered head first into a shaft to sedate a badly wounded man. The description of this is horrific yet forensic in its detail, even down to the way she held the torch in her teeth & looked back on her acrobatics training with gratitude as she fought nausea & dizziness to stay conscious & help the man. The sound coming from the hole was unnerving me - it was like an animal in a trap. I had once heard a long screaming like rabbits in traps from children with meningitis in India, but this was worse - almost inhuman in its agony. The torch showed me that the debris lay over both arms and that the chest of the man trapped there was crushed into a bloody mess - great beams lay across the lower part of his body - and his face was so injured that it was difficult to distinguish the mouth from the rest of it - it all seemed one great gaping red mess. One of the worst jobs Frances was required to do was to reconstruct bodies blown apart by bombs, putting the limbs back together so that the families could be shown a body to identify. Sometimes there weren't enough limbs & body parts to make the right number of bodies. The macabre nature of the task was mitigated by the knowledge that it just had to be done. There was no time to show fear or to be ill or disgusted; time enough for that when the work was finished. It was only when she had to visit a sick child on the top floor of a house (where no one willingly slept during a raid) that Frances felt afraid. I think it was during some of those many visits to Raymond ... that I first began to know real fear. Up to that time I had not really minded the Blitz at all. I had just married, and we were very happy, although the occasions when we were both together were increasingly rare. Richard was frequently away on tour for the Ministry, and I was often on night duty, but the bombs seemed a macabre background to our personal life, and the fear that either of us would be a victim of the Blitz was a remote thought - but it was one which now began recurringly to enter my head. Life wasn't unremittingly awful, even during the worst of the Blitz. Frances & Richard managed to get away from London & go walking on the Downs in Surrey where they watched dogfights overhead & marveled at the beauty & peace in the midst of destruction & death. There were parties in Cheyne Place & amusing incidents to relieve the horror as Frances tried to keep the peace among the refugees & planned her wedding. Little Vicki was unperturbed by the bombs & the knowledge that the Green Cat was serenely sitting on the windowsill guarding the house & its occupants was comforting. Frances was pregnant & had reduced her workload. Then, in December 1940, during the biggest raid Chelsea had experienced, Frances' home suffered a direct hit & was completely destroyed. Frances, Richard & Vicki survived & were miraculously able to get out of the house with minor injuries. The description of the blast & the dazed aftermath is horrifying. Frances & Richard went to the FAP, not really knowing what else to do & returned to the house to discover that they had been presumed dead. This was the end of their life in Chelsea & the Parkers left London & moved to Esher. Standing there by the great heap which had been our home without possessing even a pocket handkerchief gave me an extraordinary feeling of freedom mingled with awe. Yesterday it had been a lovely home filled with choice and beautiful objects. Like all the others round it, it had vanished in a few seconds, truly 'gone with the wind'. I understood a little then of how some of the bombed-out and refugees must have felt, but strangely enough I didn't mind at all,. I had already learned that home is to be with the person you love, and hadn't I been wonderfully blessed in having Richard, the expected baby, and even Vicki all saved? As I turned over some of the rubble looking for even a chip of the Green Cat I thought of the Second Commandment, for, like the huge carpets, the heavy furniture and easels, he had simply disintegrated into dust. This is a devastating book. I've never read a better memoir of the Blitz or one that affected me so much. The final chapters are heartbreaking to read & I read the last half of the book in one sitting, compelled & horrified in equal measure. I cannot believe that this book has been out of print for so long & I'm just so pleased that Scott from the Furrowed Middlebrow blog & Dean Street Press have brought A Chelsea Concerto back into print as the first title in their new imprint, Furrowed Middlebrow Books. Virginia Nicholson, author of Millions Like Us, has written the Foreword for this new edition. 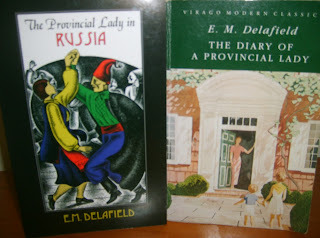 She describes her search for the author of this remarkable memoir & Faviell's life after the war as she continued to paint & wrote fiction as well as A Chelsea Concerto & another memoir about life in post-war Berlin, The Dancing Bear (all reprinted by Dean Street Press), which exorcised the memories of the war at last. 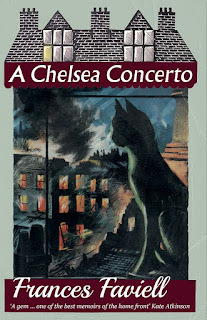 Dean Street Press kindly sent me a review copy of A Chelsea Concerto. I already had A Chelsea Concerto on order so Dean St kindly sent me Bewildering Cares by Winifred Peck which I've just finished and enjoyed it sounds a happier read than Chelsea C. which has just arrived today. I'm a bit worried about reading now, I'm not sure I can manage being depressed at the moment! I also ordered ACC & all the Winifred Pecks but when Rupert sent me a review copy, I couldn't resist reading ti straight away. I agree, it's probably not what you want to be reading right now but I'm sure you'll find the right time & be just as impressed as I was. dynamite post(no pun intended). what an ordeal to live through! and not being able to tell what the future would bring would be the worst; no wonder people went bats... tx for the intro to a stunning book! Thank you. I hope you read it as it gives such an immediate picture of what people went through. I'm always full of admiration for the way people coped day after day in such conditions. The fear must have been difficult to live with but they mostly just got on with it. This sounds like such an intense book but it fits straight into one of my main reading interests so I will be sure to get hold of a copy. I love the cover. The cover is the original artwork with the Furrowed Middlebrow surrounds of the house etc. I think you'll enjoy it if you like WWII memoirs. Thank you for the lovely review, Lyn. So glad you also found the book "unputdownable," as publishers used to say! Thank you Scott for getting ACC reprinted! I'd wanted to read it for ages so to have it readily available is wonderful. It definitely was unputdownable. I don't think you can fail to be impressed by ACC, Kat. It's a wonderful depiction of the time. I have just read this, too, Lyn. I could not put it down and found the last part so shocking. It is hard to get to grips with what quite ordinary people went through and their heroism. It is amazing that she went on to have a healthy baby! I'm always amazed by the courage it took to just get on with everyday life. No sleep, restricted food & the fear for yourself & family, friends. Then, to volunteer as FF did, such courage, although I doubt she saw it as courage. I was pleased but surprised that the baby survived after the bomb. There was such dread in those last chapters.